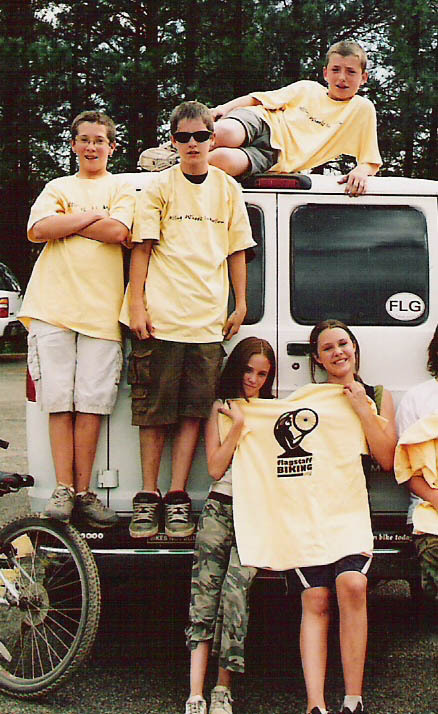 In 2004, two Flagstaff Biking Organization members co-founded this local chapter of the national Trips for Kids Program in an effort to get more kids riding bikes. Recognizing that not all kids could afford a bicycle, Flagstaff Trips for Kids takes children from diverse backgrounds and socio-economic situations mountain biking by providing them a free bicycle to use for the day and all water and snacks. Aside from Flagstaff Biking Organization, this program is sponsored by Trek Bicycles, Clif Bar and several other national companies to help keep the costs to a minimal and thus reduce the barriers of enjoying an otherwise expensive sport. Currently, Trips for Kids Flagstaff offers youth ages 11-17 mountain bike trips and trail stewardship projects in Coconino National Forest in Flagstaff Arizona. These activities provide an exciting and challenging forum for youth to interact with positive and caring adults and engage in meaningful conversation and “teachable moments.” The program uses the bicycle as a tool to combine lessons in personal responsibility, achievement, and environment stewardship through the development of practical skills and the simple act of having fun. Many of us remember riding around the neighborhood as a kid and the sense of freedom that two wheels instilled. As a result of this affinity, the bicycle allows us to share the outdoors while teaching a number of valuable lessons to youth. The growth and popularity of mountain biking creates an opportunity to engage youth in a lifelong sport that is full of excitement, adventure, and challenges. If you are a group or social worker wishing to schedule a ride, please call Melissa Dunstan at 928-606-1533 or email melissa@flagstaffbiking.org.